Continuing my series about fast animals, today I am writing about a very quick bird, the peregrine falcon. These beautiful birds of prey can grow up to 58 cm tall and have a wingspan of up to 120 cm. Females are about 20% larger than males. Peregrine falcons are the fastest animals in the world, reaching speeds of over 300 kph when they dive after their prey. They use their incredible speed to catch a wide variety of other birds, especially pigeons and doves. Some scientists believe that they can catch up to 2,000 different species of birds, which is 1 in 5 species globally. They also will catch small mammals, lizards and insects. They build their nests in cliffs, ledges, on tall buildings and in tree hollows. One pair built a nest on a building where my dad used to work in Melbourne. They lay between 1-6 eggs each year. Peregrine falcons are one of the most widely distributed birds in the world and can be found in a wide range of habitats on every continent except Antarctica. Their numbers dropped in many places due to the use of pesticides by farmers, however since these poisons have been banned, their numbers have increased again. 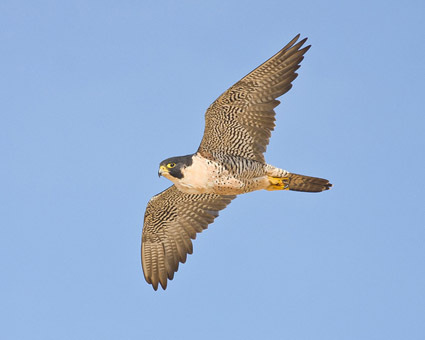 Are there any other interesting facts that you would like to share about peregrine falcons? I am a new member but I love facts.Thank you for putting the icon on here.I am in 4th grade so I might get a new username. Thank you so much for this info! I am doing research.